Today's guest post is courtesy of Natalie from the blog Smart Alec. Natalie was one of the earliest commentators on my blog. She pretty much kept me going in the early days when I was lucky to get 2-3 comments a week. We quickly struck up a friendship going back and forth between our two blogs about everything from our sons to design (of course). I'm very envious of her sun filled life in California especially as our days get darker and colder. I guess she must have had that in mind when she wrote this guest post about The Hudson Bay point blankets. I absolutely adore these blankets and actually asked for one as my Christmas present last year. Luckily, my parents obliged. If money were no object, I'd also pick up one of these Smythe coats made last year for the Vancouver Winter Olympics. I think the shape is absolutely beautiful. Natalie eludes in her post that I may have written about Hudson Bay blankets before but I haven't. I probably will in the next few months once we pull out our blanket from storage. So, consider this a primer! Enjoy! "Hi there. I'm Natalie from Smart Alec. I can't believe Emma asked me to guest blog because The Marion House Book is hands down one of my favorites. Its astounding how in such a little amount of time she has mastered the art of captivating her audience with beautiful posts. I have learned a lot from her posts so I asked myself, "what would Emma write about?" I'm pretty sure she may have written about Hudson Bay Company's point blanket as she is a patriotic Canadian through and through. As the temperatures dip, these blankets just ooze cozy, rustic, and authentic charm and still manage to look modern, streamlined, and cheerful in any room. They seem most appropriate for wood cabins but would be just as home in modern downtown lofts. 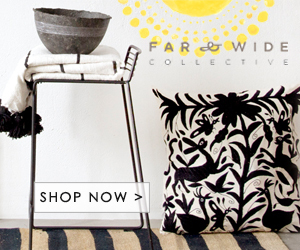 The first time these blankets caught my eye was from the summer cottage of the duo behind Kitka Design. The combo with plywood walls seemed just right to me in regards to mixing rustic and modern in one space. But I also like this more rugged example. And adding the charm factor as discussed earlier. If you would like to buy your own piece of woolly heaven, you can buy the original, or the LL Bean version, or this Americanized Pendleton version. Send in your examples of how the HBC blanket jazzed up a room.